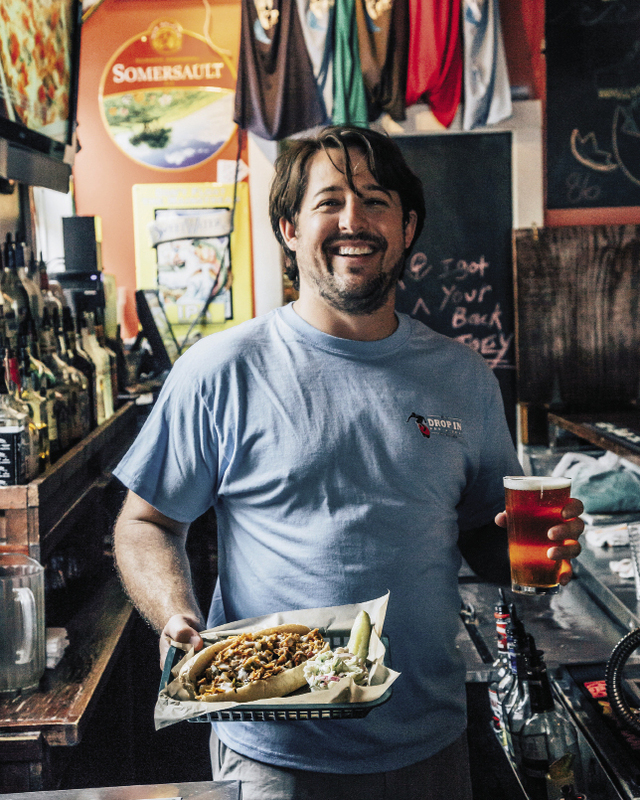 Aaron Alexander serves up The Redneck cheesesteak with a seasonal draft at this favorite watering hole. 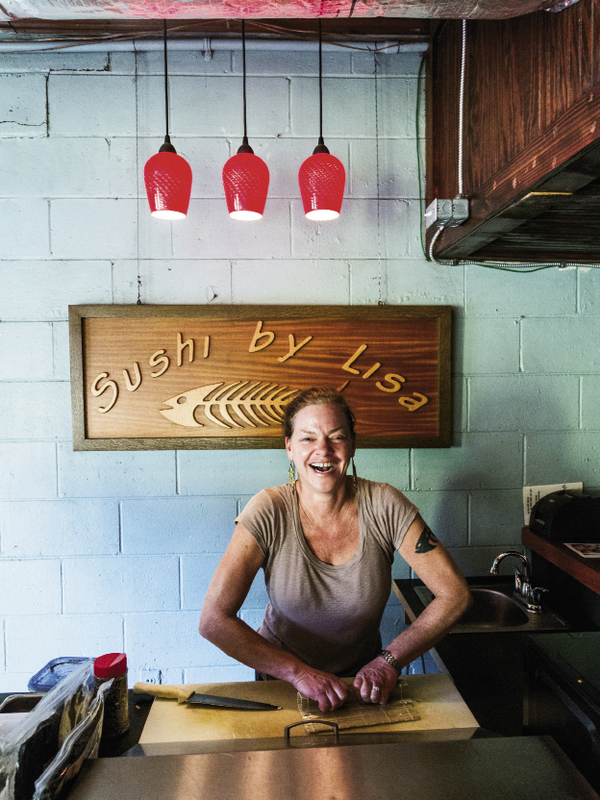 The menu includes salads, sandwiches, and Tex-Mex fare, as well as hand-rolled sushi by Lisa on Tuesday through Friday nights. A couple of Lisa’s creations: the Scorpio Roll (top) combines shrimp, cream cheese, mango, almonds, and spicy sauce, and the Little Wahine (right) has spicy tuna, eel, fish roe, and scallions. Hank Weed and partner Cat Forester opened this easy-going, Caribbean-inspired gathering place, where you can find tacos and curry bowls aplenty; beer, wine, and sangria; and live music most weekends. 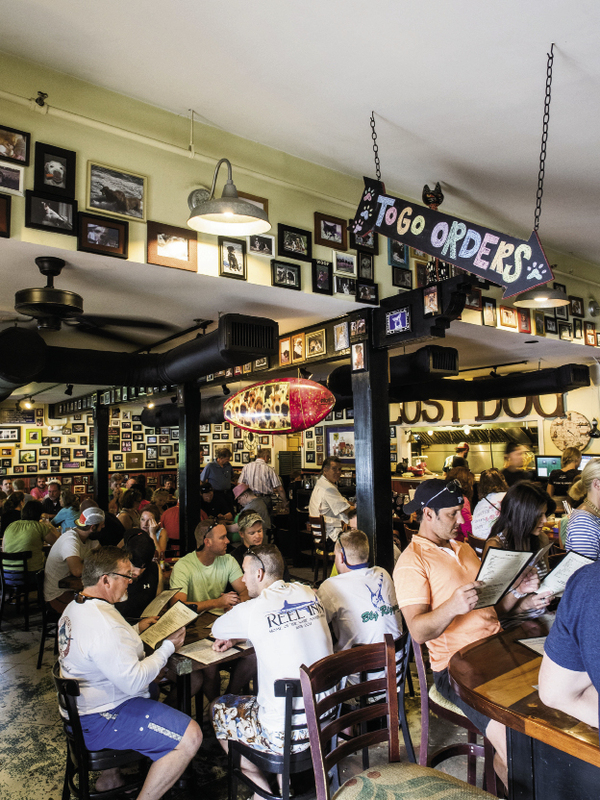 First opened on Center Street in 2002, this popular joint soon outgrew its digs. Now it’s located on Huron Street, where you’ll likely find a line on most days. 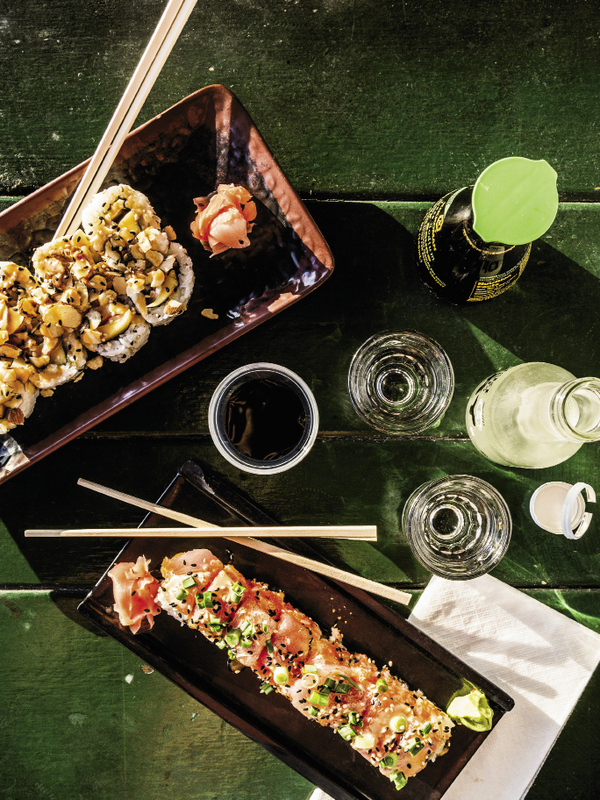 Happily, picnic tables and a nearby park make for a comfortable and well-worth-it wait. 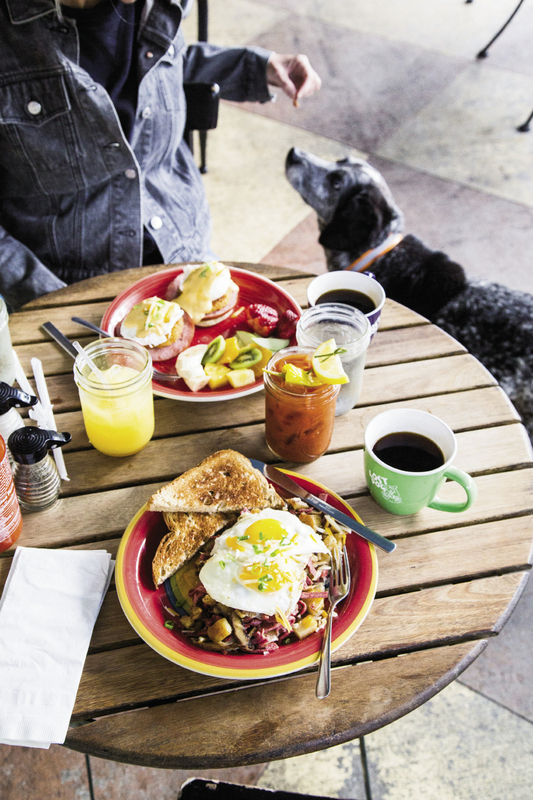 Favorite brunch picks at Lost Dog Cafe—a pooch-friendly spot (at outdoor tables only)—are corned-beef hash and eggs and the eggs Benedict. Don’t forget the “licker” drinks, house-made Bloody Marys and Mason Jar Mimosas. 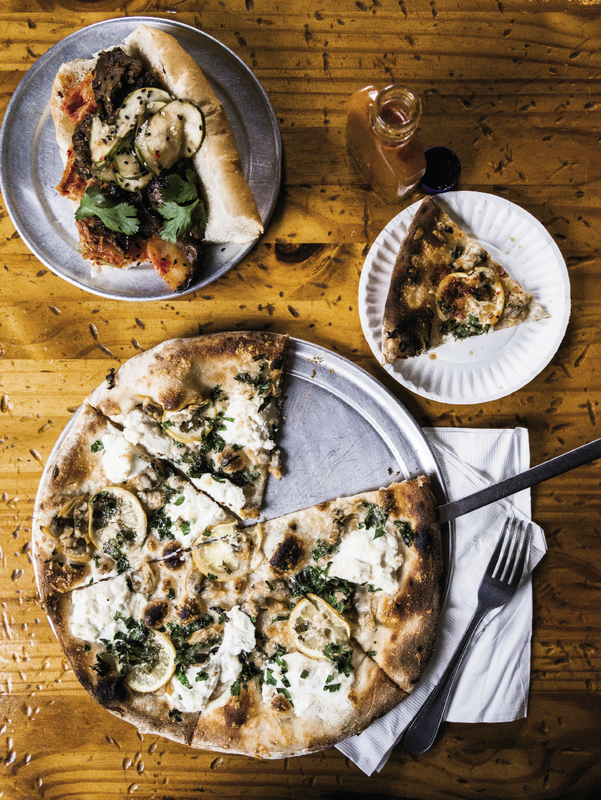 The ’Wich Doctor’s incredible white clam pizza is made in the Neapolitan style and topped with garlic oil, ricotta, Parmesan, Italian parsley, and lemon. After 30-plus years in F&B, Jeff Butler (above) and his wife, Krista Hines, opened this “small space that’s huge on taste” in March 2011. 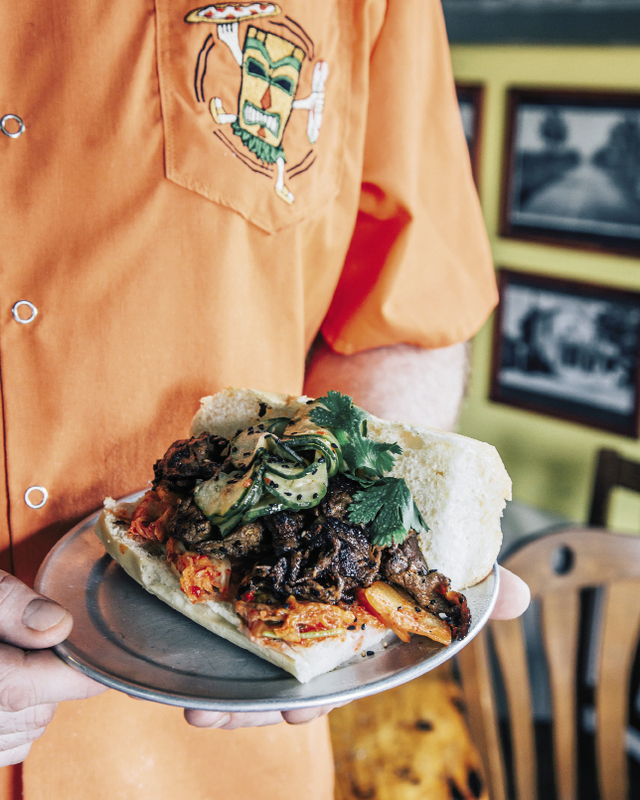 The Korean BBQ sandwich is piled high with Bulgogi-style beef with kimchee and quick-pickled cucumber. Sunset Cay Yacht Club: At the south end of Folly, turn right onto 9th Street and follow the paved road to the end. 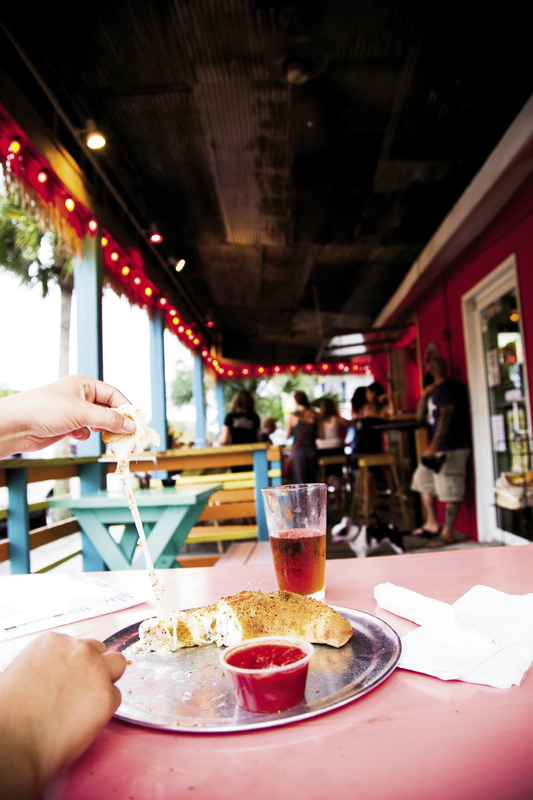 Upstairs from the marina, you’ll find this casual hangout with fried seafood and cheap beers set against the backdrop of the Intracoastal Waterway. 66 W. 9th St. Ext. Monday-Friday: 4-9 p.m., Saturday-Sunday: Noon-9 p.m. (843) 588-0001 Note: Membership requires $5 in dues and a 24-hour waiting period. 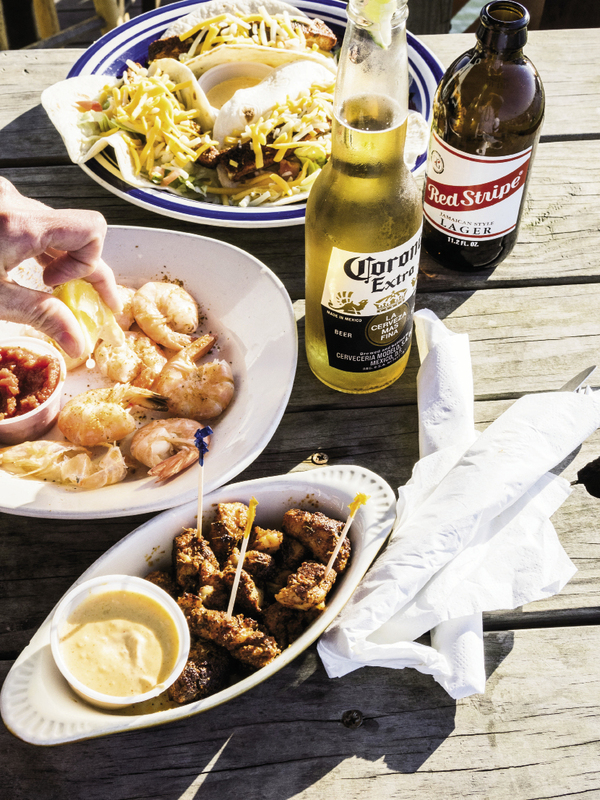 Snag an outdoor table at Sunset Cay for fish tacos, steamed shrimp, and blackened grouper bites. It still shines like a neon beacon, out beyond the old docks of Oak Island, past the mounded oyster banks of a thousand Bowens Island feasts, still a carefree oasis at the culmination of that two-lane ribbon of blacktop shuffling sunbathers and outlaws to the Edge of America. 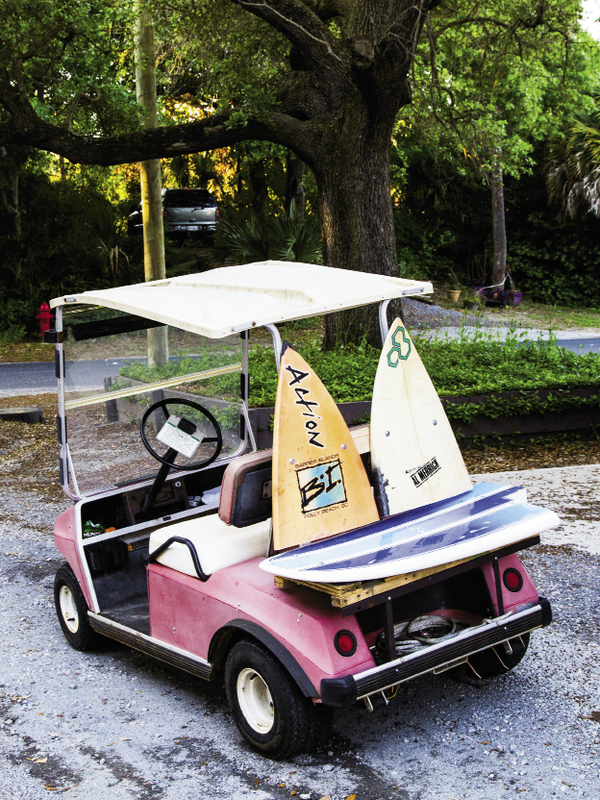 They’ve come for decades in droves—so many on a blue-sky summer day that the cars heading in can queue back a country mile across James Island for hours at a time. Some say it’s not the same anymore. They see new paint as detriment and speak of an older bohemian scene the way flattop conservatives idealize the days of Eisenhower. Others pine for opportunity and the promise offered by any stream of humanity lacquered in coconut oil and well-lubricated with stiff libations. 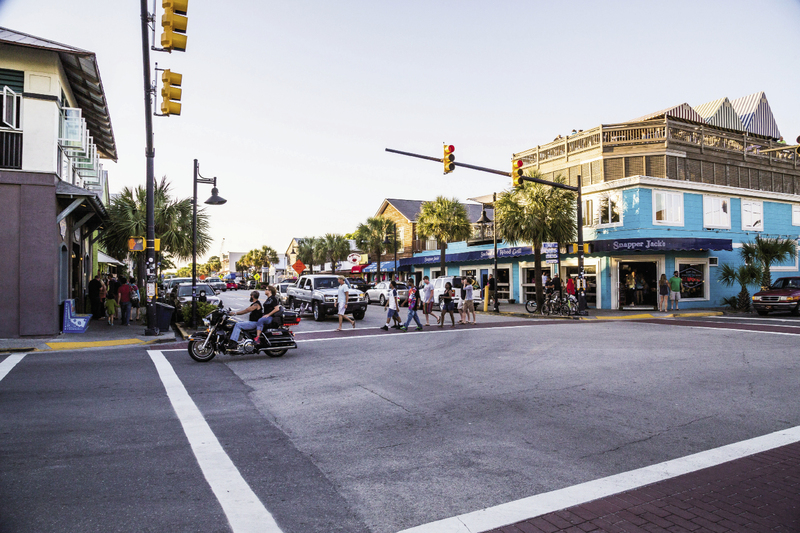 Folly Beach long ago gave over its aptly named Center Street to the commercial interests of beachside pizza, cold beer, crab bites, and burger shacks. 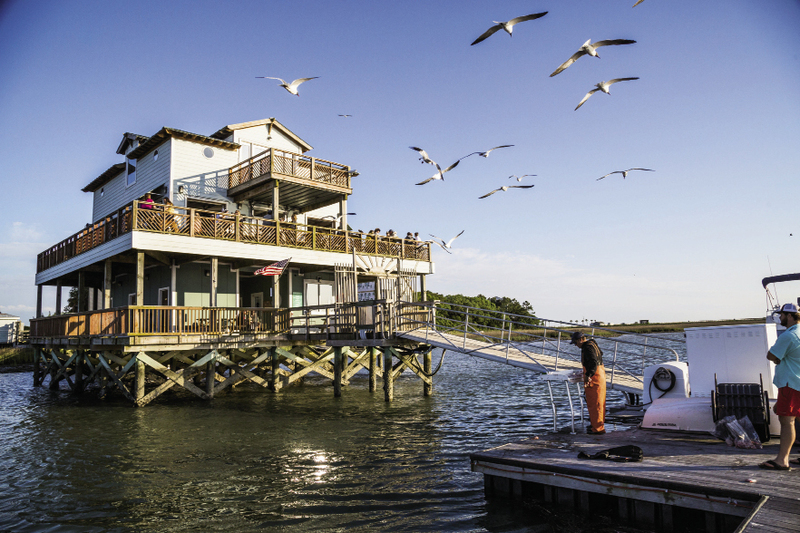 Over time, the various fish stands and dive bars have evolved and matured into something different, but even the swankiest of new digs hold onto The Edge, that bit of scruff and scraggle that defines this beach. You don’t come to town trying to change Folly; in the end, it changes you. Head over on a Friday night, when the storefronts glow like urban fireflies from signs and windows proffering cold Budweiser and beach bikinis. Bring the family to Woody’s—the mainstay if there ever was one—a small space with an ample bar, jukebox, an old pinball machine, and a slogan offering “Pizza. Subs. Cold Beer.” Grab a large pie and teach your kids the locals’ penchant for dipping the crust in the honey supplied on every table. 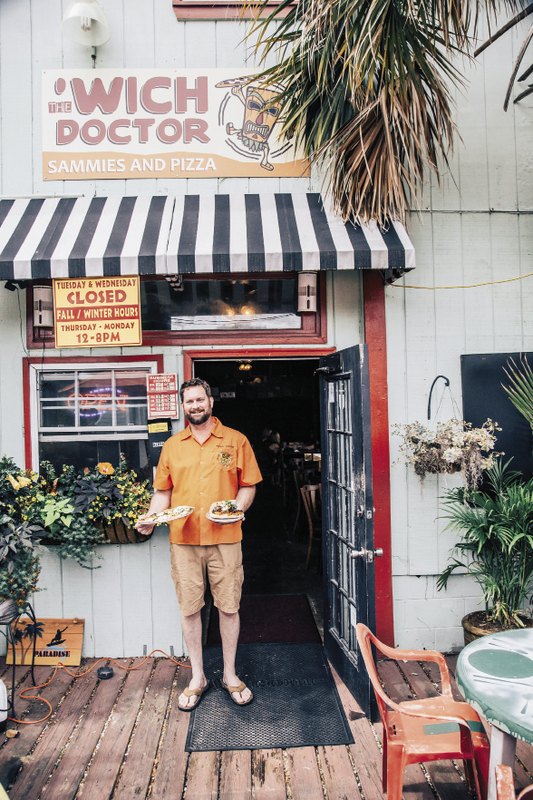 Or go for the calzone with sausage and extra cheese and ask bartender Jess Watkins to “put the sauce on the side,” as my friend, local chef David Szlam, recommends. 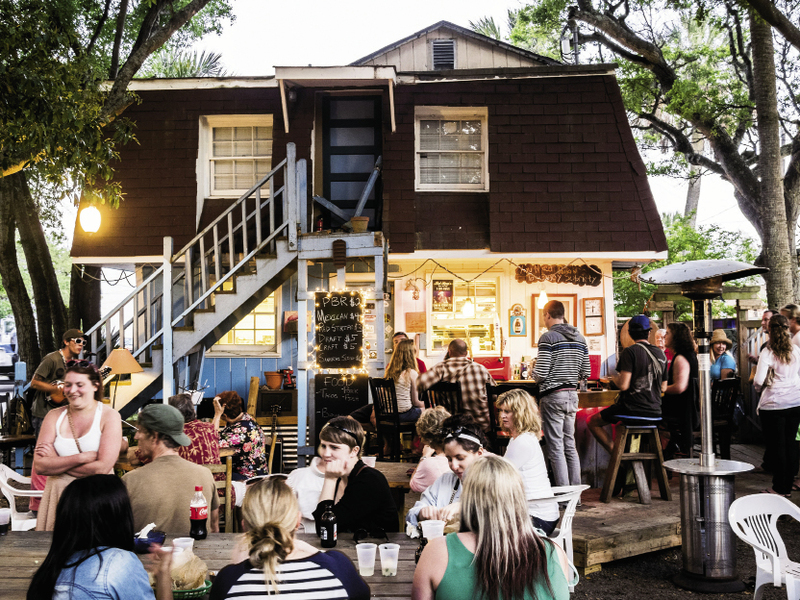 Snag a seat outside on the patio and you can catch the Folly vibe, a solid stream of Southern gothic halfway between the tank tops of the Grand Strand and golf shorts of Hilton Head." 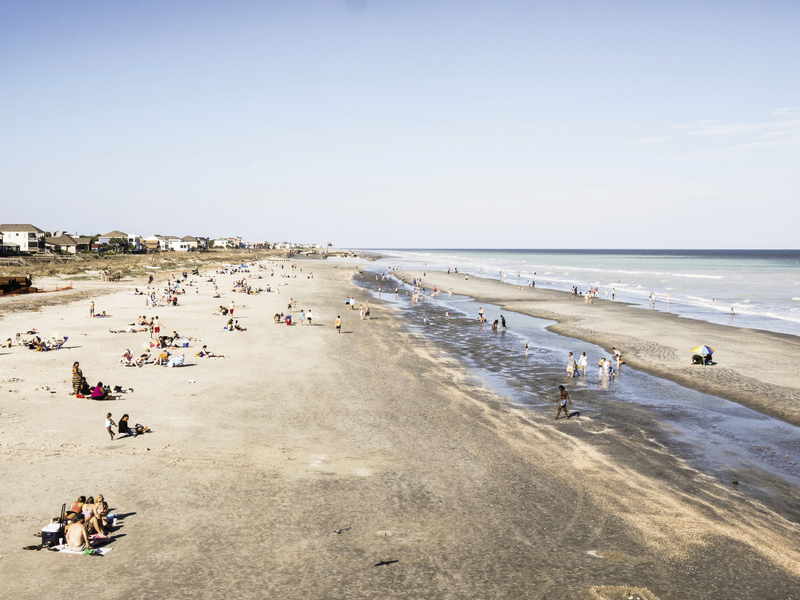 Or leave the kids behind, because Folly hosts the best pub crawl on the South Carolina coast. Start at The Drop In Deli, perhaps the hippest dive bar on the strip, manned by proprietor Lewis Dodson and his masterful handlebar mustache. Here, he serves up The Redneck, a chicken cheesesteak loaded with Cheese Whiz, bacon, jalapeños, caramelized onions, and ranch dressing. He can get you a fancy beer with that or the ubiquitous beachside Pabst Blue Ribbon. Or just belly up to Lisa’s small food station; she rolls sushi late into the night by the front door. 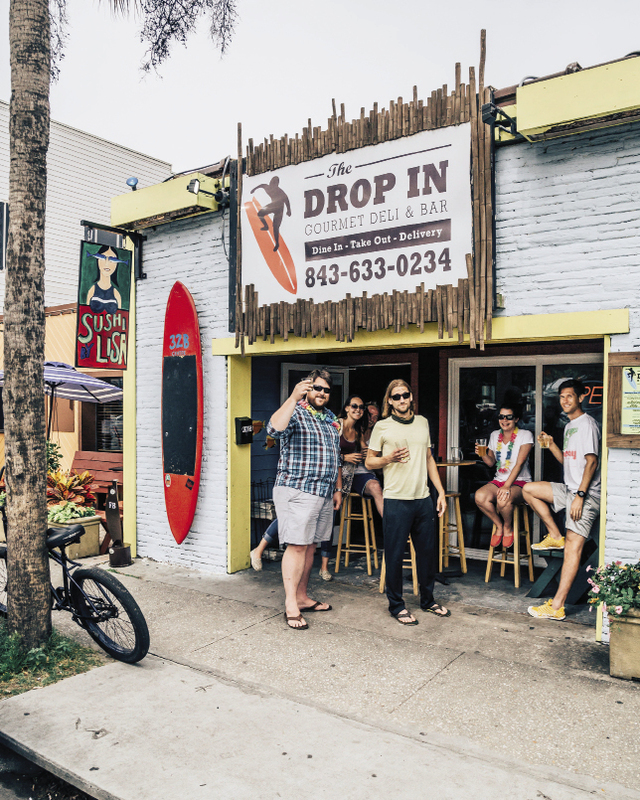 If you’re more of a surfer type, then your preferred dive might be Surf Bar, a legend of a structure known as much for the constant flicker of surf videos on the flat screen behind the bar as it is for its outrageously good Philly cheesesteaks. Filled with locals as colorful as the trinkets and ephemera that line the walls, it’s the quintessential Folly hangout. Some nights they have homemade pork rinds, fried crispy and served with hot sauce. You won’t want to miss The Sand Dollar, so plan ahead. Duck into this club the day before and buy a membership for a dollar. 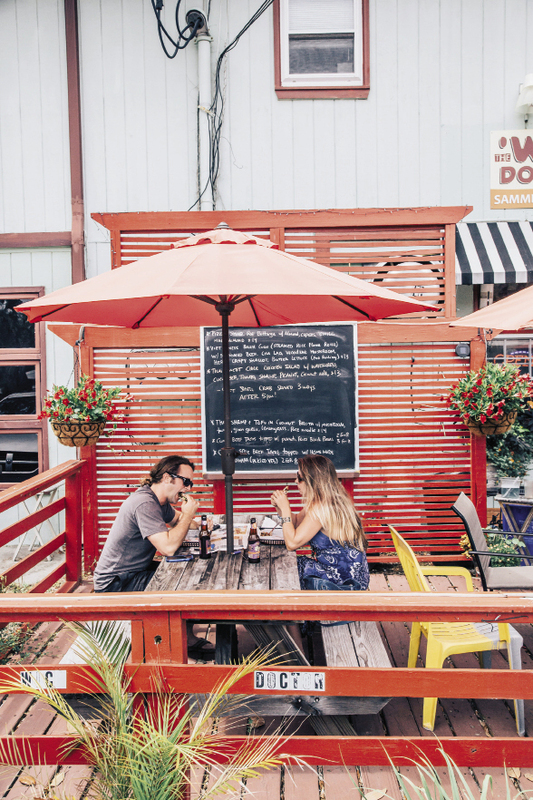 You have to wait 24 hours to get in, but there’s not a better example of a smoke-laden biker beach joint this side of Daytona—certainly worthy of a stop on a tour of Folly dives. Regrouping the morning after means a chair at Tides Hotel’s back deck, where BLU’s Beach Bar offers a fantastic view of the fishing pier jutting into the Atlantic. They make a mean Bloody Mary, and mimosas on Sundays. Those in the know head down the street to Chico Feo, a Caribbean-inspired shanty that would be right at home in a Jimmy Buffet song. 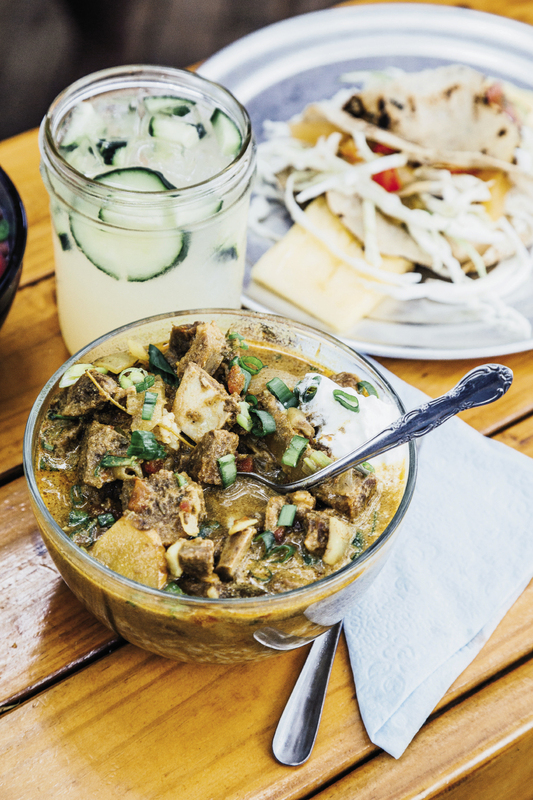 This hippie-dippie outpost whose name translates as “ugly boy” is not so much a restaurant as a shady backyard, where soul mates Cat Forester and Hank Weed dish out cold PBR for $2 and a steady supply of tacos and bowls—a favorite teems with goat curry, rice, and beans—from the ever-changing menu. Try the elusive “Wu-Tang Bowl,” a ramen concoction with flank steak, soft-boiled eggs, hot peppers, and sprouts. They also have bands on the weekends who croon from a ramshackle gypsy porch until 2 a.m., weather permitting—a perfect place to hide from the summer sun or boogie the night away with kindred spirits. 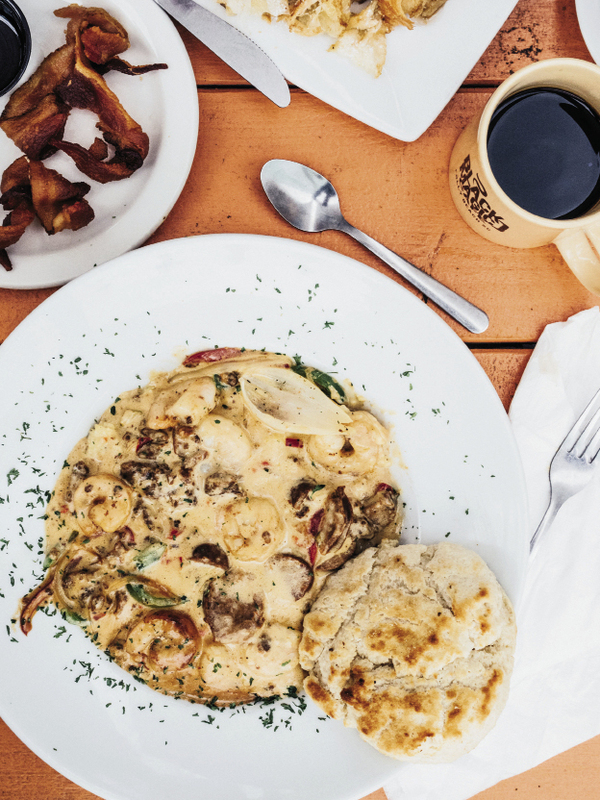 If it’s breakfast or brunch you’re after, then Folly offers a wealth of choices. Aromas of traditional morning fare waft out the doors of the Lost Dog Cafe. The inviting porch of this tin-roof shack begs its visitors to slow down and stay awhile. Islanders swear by the corned-beef hash often gracing the specials board, and the old standby seems to be the eggs Benedict, which if you’re lucky are sometimes embellished as a special with crab, fish cakes, and fresh asparagus. 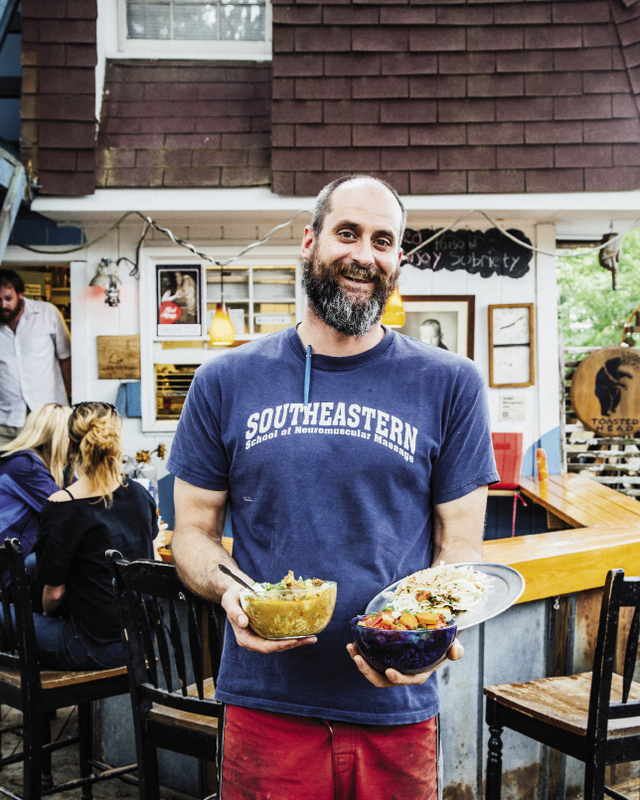 A full coffee bar slings a steady stream of steaming bowls, but the line can be long at The Dog, so I often begin at Black Magic Cafe, whose shrimp and cheese grits shouldn’t be passed by. Of course, they serve some quality coffee here as well, and the numerous sandwiches and plates lining the chalkboards overhead make it hard to choose, so come back at lunch for the fish tacos, some of the best in town. everything from a Sichuan pork belly number laden with shaved cabbage and a fried egg to a chicken and waffle sandwich layering a fried breast between two Eggo waffles. He has Brussels sprout pizza and will top anything with tofu for a dollar and a half. Shuffle in and say hi before grabbing a drink from the glass-front case and ordering at the register. 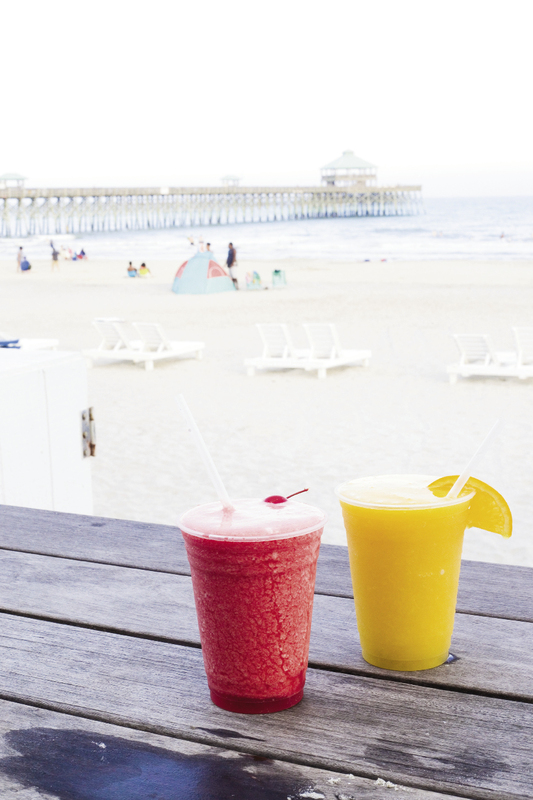 Taking the family out to the beach requires a different approach, and there’s no more suitable venue than Rita’s Seaside Grille. 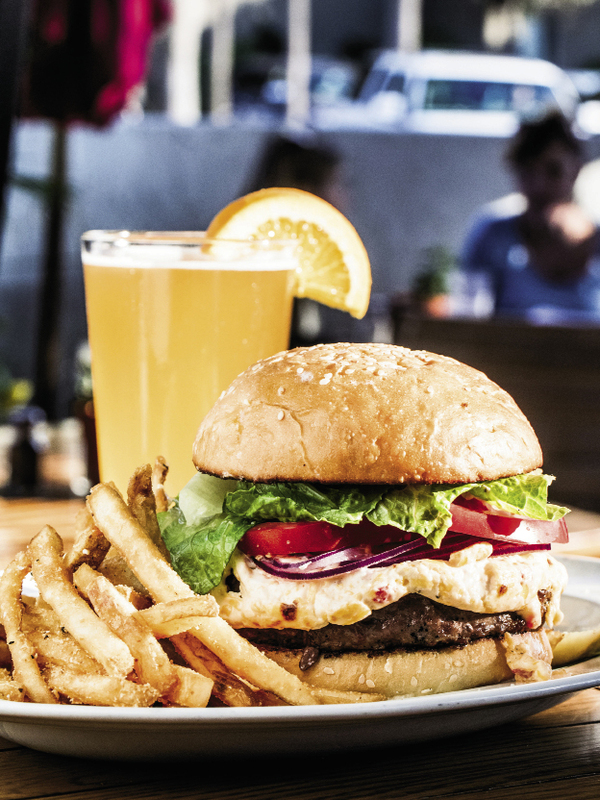 Currently managed by the same folks who own the luxurious Halls Chophouse downtown, this is the place for burgers. It’s convenient to the beach and the pier, just across the blacktop from the Tides hotel, an easy landmark to rendezvous for a filling meal. 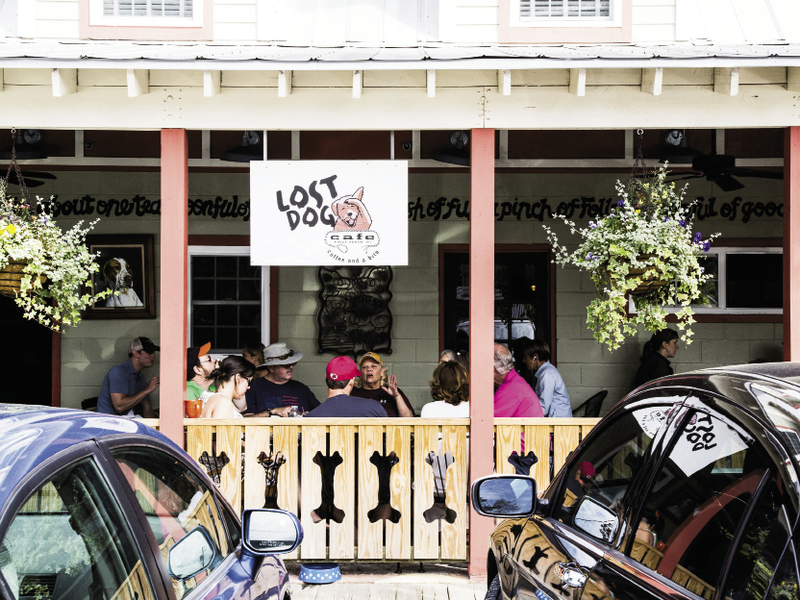 In addition to the array of big, handmade patties, they offer a full menu spanning the ubiquitous Folly fish tacos to “drunken” chicken and fried shrimp. Live music often graces the patio on summer afternoons making it the ideal place to fuel up after a long day of playing in the sand. If you haven’t had enough by now, there are numerous places to grab a dinner bite. Taco Boy serves up its familiar Tex-Mex fare right on the Center Street strip. Those looking to approximate a fine-dining experience might opt for the inside of BLU and its fresh fish options, but fancy dishes are not what Folly does best. 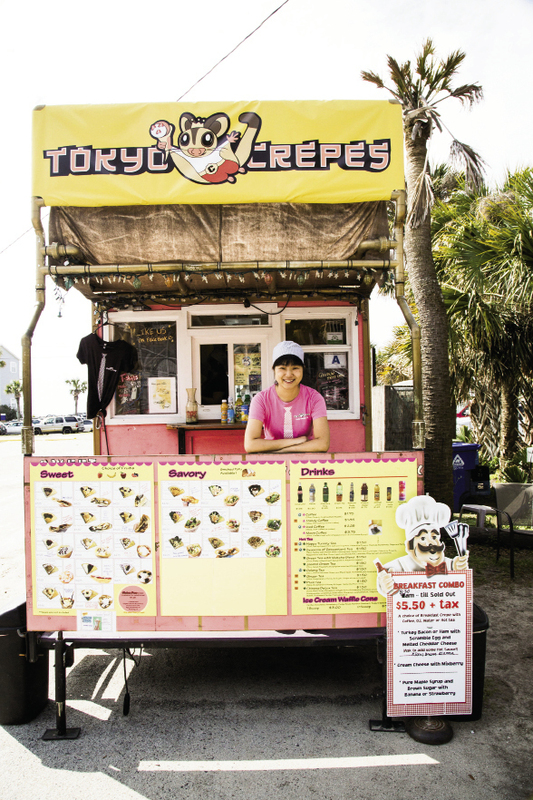 Maybe you take the kids by Tokyo Crepes for dessert. For years now, this food truck has been dishing out sweet (and savory) pancakes, filled to the brim with bananas, Nutella, chocolate, and fruit in various permutations. Turn the young ones in early and head down to the south end of the island before dusk to Sunset Cay Yacht Club. Like the Sand Dollar, you’ll need to buy a membership here a day ahead of time, but be glad you did. 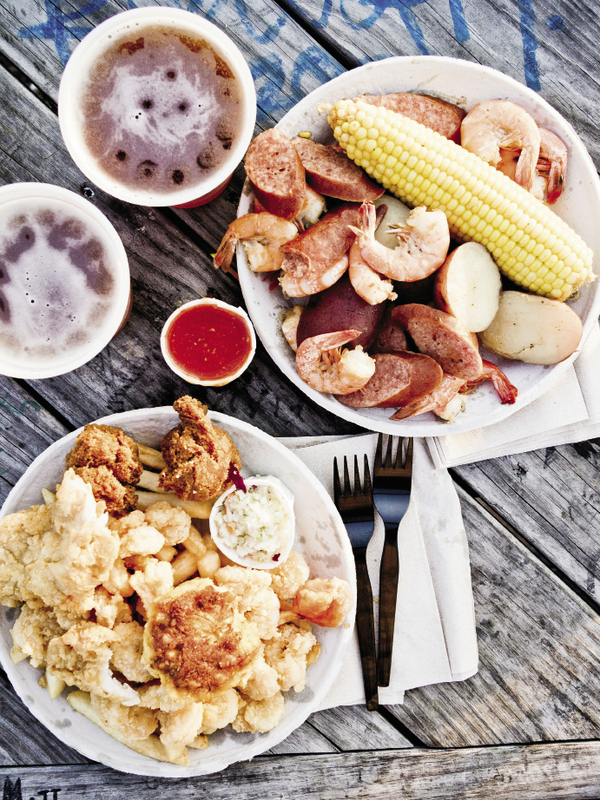 The limited menu includes some tasty treats: Blackened grouper bites and crab dip get ordered most often, but the boiled peel-and-eat shrimp and monster crab cakes are equally deserving of praise. As is the cheap beer—and those offerings alone would make it worthy—but this place lives up to its name, boasting the most beautiful sunset views on the island. 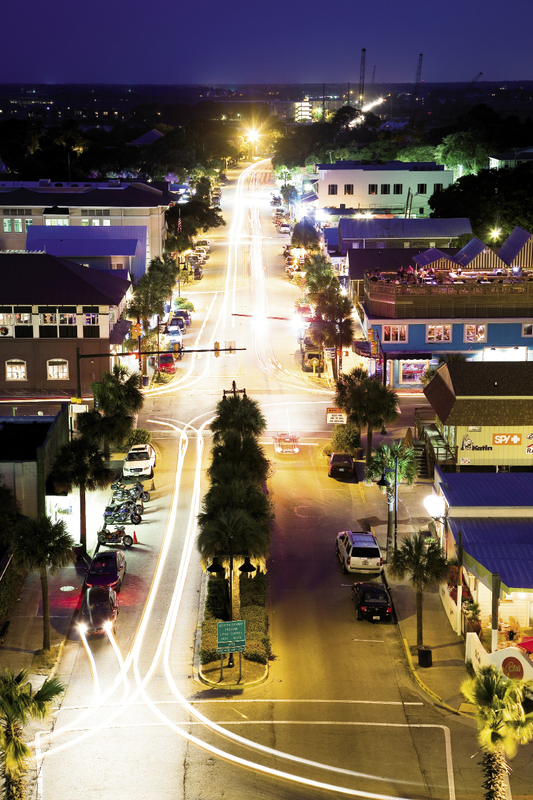 Here, you can kick back and enjoy the last vestiges of a beach-going summer day as the sun dips below the marsh, the neon lights begin to illuminate the watering holes of Center Street, and the sky fades. Wear your flip-flops to Sunset Cay. You’ll fit in better and then, when you cross the little bridge to the parking lot and your car, the sand between your toes will remind you that one can’t help but carry a little bit of the real Folly home with them if they take the time to seek it out in the first place. Monday: 5:30-11p.m., Tuesday-Thursday & Sunday: 11:30 a.m. - 11p.m., Friday & Saturday: 11:30 a.m.- 12 a.m.
Monday-Friday: 4 p.m.-2 a.m. & Saturday & Sunday: Noon-2 a.m.
Monday-Thursday: Noon-2 a.m. & Friday-Sunday: 10 a.m.-2 a.m. Note: Membership requires $1 in dues and a 24-hour waiting period. Happy Hour: Monday-Thursday, 4-7 p.m. Mon.-Sat. : 6:30 a.m.-3 p.m. & Sunday: 6:30 a.m.-2 p.m.
Thursday-Monday: Noon- 8 p.m. & Tuesday: Noon-3 p.m.
Daily: 11 a.m.-11 p.m. Saturday & Sunday brunch: 10 a.m.-2 p.m.
66 W. 9th St. Ext. Monday-Friday: 4-9 p.m., Saturday-Sunday: Noon-9 p.m. Note: Membership requires $5 in dues and a 24-hour waiting period. Serving breakfast, lunch, and dinner daily: 7 a.m.- 10 p.m.
Monday-Saturday: 8:30 a.m.-10:30 p.m., Sunday: 8:30 a.m.- 10 p.m. Holidays mean special dishes, and when talking about Hanukkah, that can only be one thing: potato pancakes.